With growing health needs, is digital the best medicine? 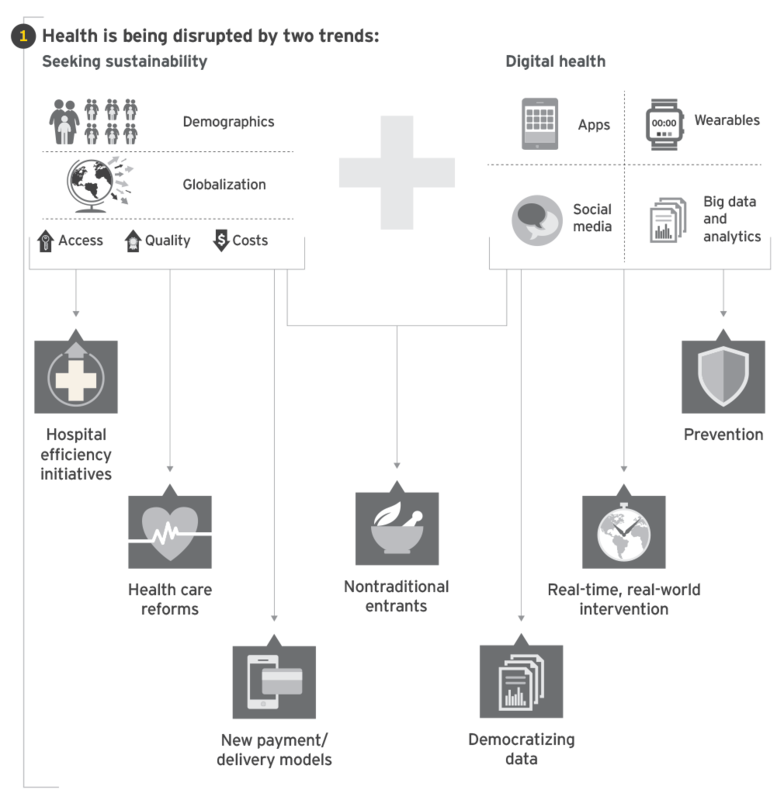 Health care’s reinvention is being driven by two main factors: the search for economic sustainability and digital disruption. Health care spending is on an unsustainable trajectory, thanks to demographic shifts and globalization. But just as health systems need to contain costs, digital health has emerged to enable approaches that are dramatically more cost-effective. The search for economic sustainability is playing out in different ways across different geographies – from health care reforms in many markets to – mobile health solutions that expand access in rural areas across Africa to investments in health care systems in the Persian Gulf and emerging markets such as China. Developing sustainable approaches will require varied skills, from app development to analytics to customer engagement – attracting entrants from sectors such as technology, telecommunications, and retail. This creates opportunities for cross-sector partnering, but also raises the specter of disruption for mature health care incumbents. 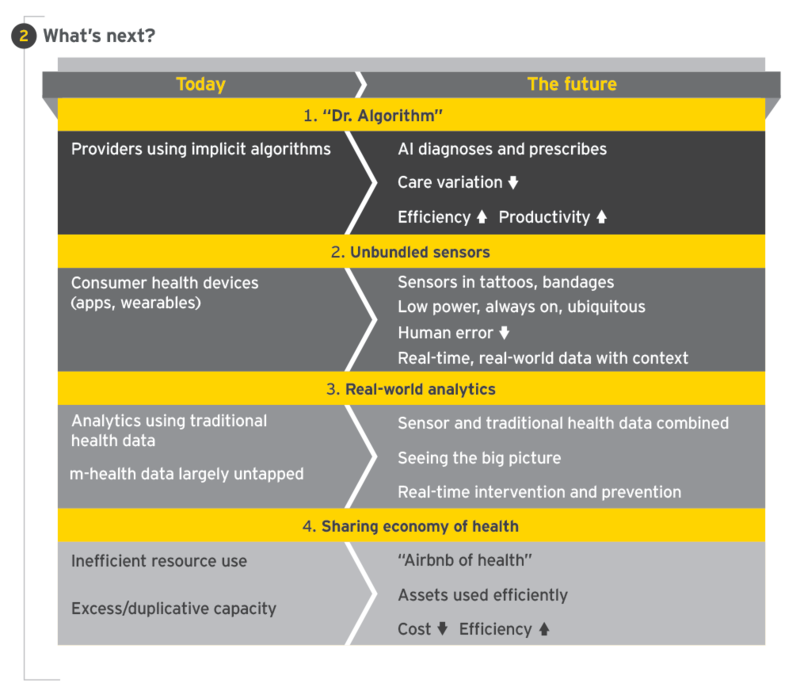 Over time, these trends promise to take us to Health 2.0. Instead of being passive recipients of care, patients will become empowered consumers, with more information and control over their health decisions. Instead of being delivered only in hospitals and clinics, health care will be available wherever patients happen to be. Artificial intelligence: Much of medicine involves heuristic, rules-based problem solving based on symptoms and test results. This is fertile ground for AI. Sensors: The next generation of sensor technology – cheaper, smaller, more efficient – will unbundle sensors from phones, embedding them in tattoos and adhesive bandages. Real-world analytics: Combining the gold mine of sensor data – largely untapped by today’s analytics initiatives – with patients’ health records will be a game changer. The sharing economy: Sharing economy platforms could have tremendous applicability in health care systems, which are rife with excess capacity. While the number of mobile health technologies has grown rapidly, mainstream adoption has remained elusive. The next generation of sensors – less invasive and with more accurate and useful data – could finally take us to the tipping point. Digital health has also compounded the challenge of fragmentation in health care, thanks to the rapid proliferation of data sources. Expect to see more partnerships and acquisitions to access data, as well as analytical techniques, industry standards and platforms to integrate it.